The Teensy USB Development Board is a complete USB-based microcontoller development system. Only a standard Mini-B USB cable (sold separately) is needed to connect to a PC or Macintosh. This version has solder pads for all I/O signals. The Teensy is also available with the header pins to plug directly into a solderless breadboard. PJRC intends to continue production of Teensy 2.0. 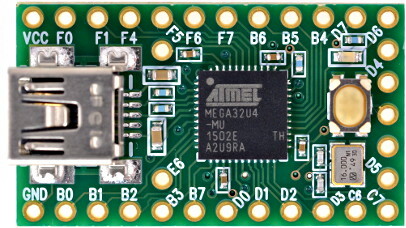 We have purchases scheduled with Atmel sufficient to keep Teensy 2.0 available until at least April 2021, assuming sales continue at 2017's rate. This doesn't necessarily mean we will discontinue Teensy 2.0 in 2021. That's a decision we'll consider in late 2020. We understand many people use these older 8 bit products. While we can't make an absolute gaurantee of future availability, we can tell you we're planning to continue production of Teensy 2.0.